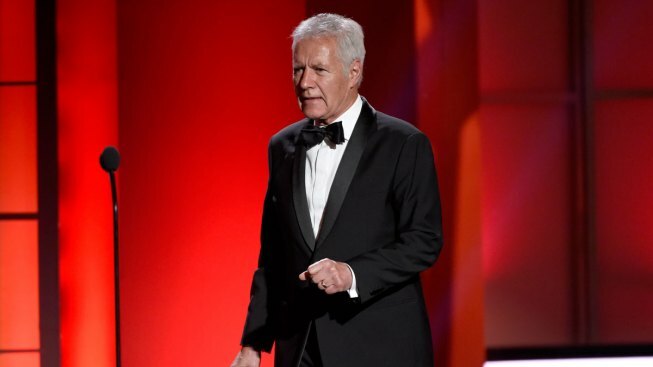 Alex Trebek walks out on stage at the 44th annual Daytime Emmy Awards at the Pasadena Civic Center on Sunday, April 30, 2017, in Pasadena, Calif.
Taping of the game show "Jeopardy!" has been suspended while host Alex Trebek recovers from surgery to remove blood clots from his brain, Trebek and the show's producer said Thursday. Trebek, 77, who has hosted the show for more than 33 years, said he was diagnosed with the blood clots, a condition called subdural hematoma, in December after he suffered a bad fall in October. In a video from his home, Trebek downplayed the operation as "a slight medical problem" and said he hoped to resume taping "very, very soon."